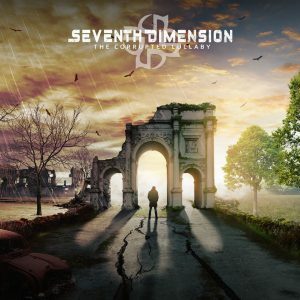 Big news from Seventh Dimension! We are happy to unveil the cover and super excited to announce our upcoming new album ‘THE CORRUPTED LULLABY’! It will be released and available digitally on November 1st on most music platforms such as Spotify, iTunes, Google Play, last.fm and many more! ‘THE CORRUPTED LULLABY’ is a double-CD concept album with a story from start to finish accompanied by more than two hours of music. The album was mixed and mastered by Anthony Berlin and contains contributions from several voice actors as well as additional vocals provided by Linda Lundberg of the band Since Ever. Being our biggest ambition to date, we didn’t wanna reveal anything until the product was finished. Now that the album is mixed, mastered and ready for release soon, it feels great to finally share some news! Posted in Announcement and tagged as Announcement, New album, The Corrupted Lullaby.